From traditional subway tile to shiny metal, there are endless choices for the kitchen backsplash. With so many options, making the right choice can sound daunting, especially since the backsplash can be a focal point in the kitchen. To help ease some kitchen renovation anxiety, we’re breaking down some of the most popular kitchen backsplash trends that are sure to make a statement in your next project. HGTV’s Fixer Upper has made shiplap a household name. A reclaimed wood backsplash can warm up stainless steel appliances, concrete countertops, and give the kitchen an overall farmhouse chic look. Even better, are wood tiles! Often made of porcelain or ceramic, these tiles can be made to look like reclaimed wood giving you the rustic look with the added low maintenance tile is known for. Mirror glass backsplash adds a modern look to kitchens and comes highly recommended in smaller spaces. Once installed, mirrored glass immediately makes the kitchen feel larger, especially when paired with light colored countertops. While mirrored glass is very durable, you will want to note that you will be polishing this surface frequently if you hate fingerprints on glass! There are so many glass tile options to incorporate it into the kitchen, which makes it such a popular choice. With various sizes, colors, patterns, and even the variability of painting the wall behind the glass with a pop of color, you can truly get a customized look. Glass tile is also extremely hygienic and mildew resistant, which many families with allergies favor. 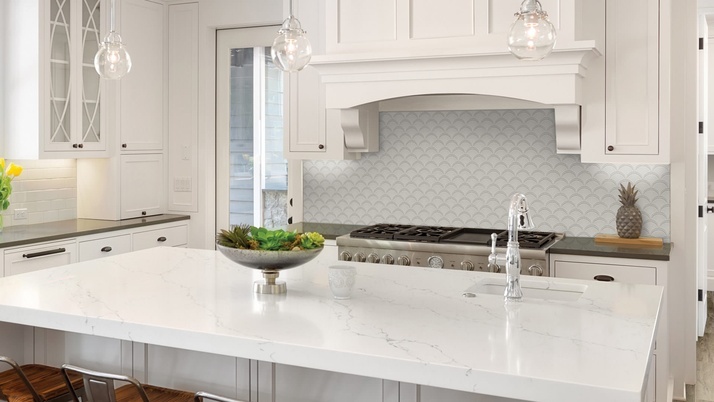 Lately, rather than separating the “space” of countertop and backsplash, we’ve seen many homeowners choose to bring their natural stone surface of quartz, granite, marble, etc. all the way up to the cabinets. This fresh look rather than emphasizing one part of the kitchen (the countertop or backsplash) unites the entire space. And for those who have chosen a natural stone with a lot of character and finish, this option highlights those features. Texture is a very hot trend in interior design. From crushed velvet window treatments to hand scraped wood flooring, texture can be found in a variety of design elements. Pairing textured tile is best used in a more neutral kitchen. Mild cabinets and countertops allow a textured tile to add depth and statement to the overall look. Whichever trend you ultimately decide on your next kitchen project should focus on your overall style of the home. Modern mirror tiles can drastically clash in a country style home. Working with the Alfano Renovations design team can help you to incorporate a new trend into your kitchen while maintaining the overall design of your home.